Last year at the Museum of Modern Art (moma) in New York, “Items: Is Fashion Modern?” exhibited 111 pieces and accessories from around the world that proved influential in 20th- and 21st-century fashion. Among them were three examples of a square cotton cloth from the Arab world: the kufiya. 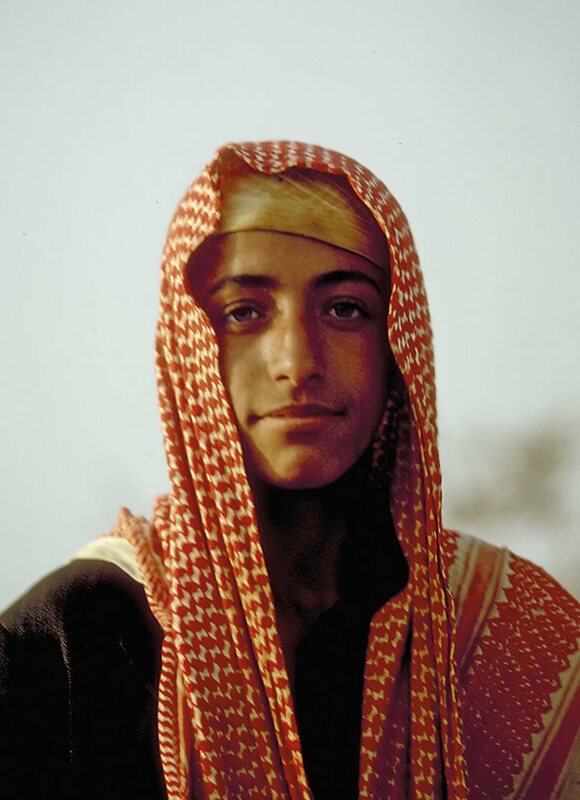 Posing for a portrait in 1975 in the ‘Asir region of Saudi Arabia, a young man wears a traditional red-and-white kufiya, called a shamagh in Saudi Arabia. Across the Arab social spectrum—from hinterlands to capitals, from shepherds to software developers, revolutionaries to royalty, the kufiya has long been a sign of Arab identity. With fashion’s insatiable appetite for fusion, and especially since the proliferation of social media, the kufiya has been crossing historic cultural and geographical boundaries to step—confidently, it appears—into the lexicon of global cool. 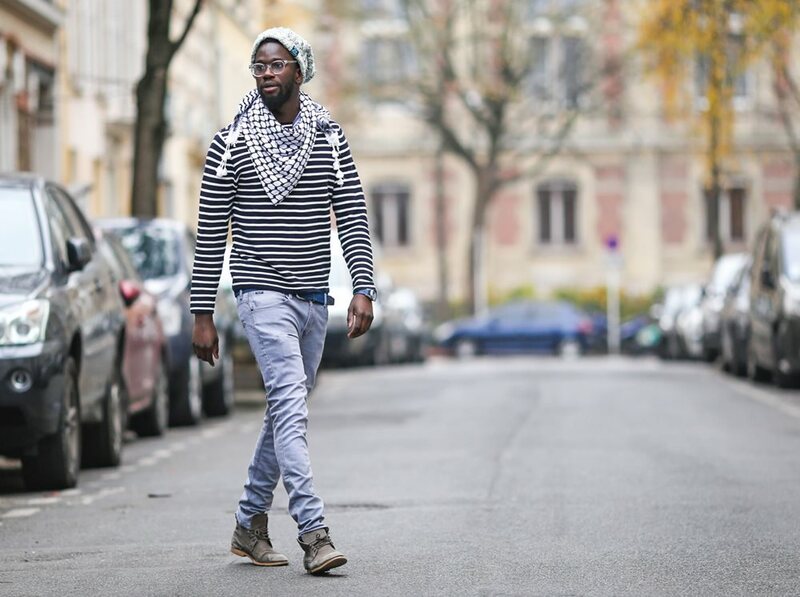 In Paris, model Sidya Sarr wears a traditional black-and-white kufiya less for utility and more for street style. Knowledge about the woven designs of the kufiya has been transmitted orally, and lore has it that the main patterns reference the professions of those who first wore it. The so-called fatha design (FAHT-hah; literally “opening” and popularly “fishnet”) is said by some experts to represent the nets of the fishermen of southern Mesopotamia—probably the marshlands of southern Iraq and possibly even lands farther south along the coasts. But this is contested. In alternate tellings, from mountainous areas, it is referred to as the “honeycomb” design, in reference to beekeepers; some rural Syrian interpretations say it symbolizes the joining of hands and the marks of dirt and sweat wiped off a worker’s brow. The other major design, called the qamah (wheat) design by the kufiya makers of Hebron, is a reference to Jericho, one of the first known major cities to practice wheat cultivation. There is also the plain white cloth called hattah (simply meaning “scarf”) worn by city dwellers in Gulf states, where it is often called a ghutra, and sometimes by leading members of rural leadership there as well as Jordan, Syria and Palestine. To make his point, al-Kadi gave literal form to his metaphor with a kufiya made out of Kevlar body armor—painted gold. It was flanked on the gallery wall by traditional cotton kufiyas, one black and white and the other red and white. 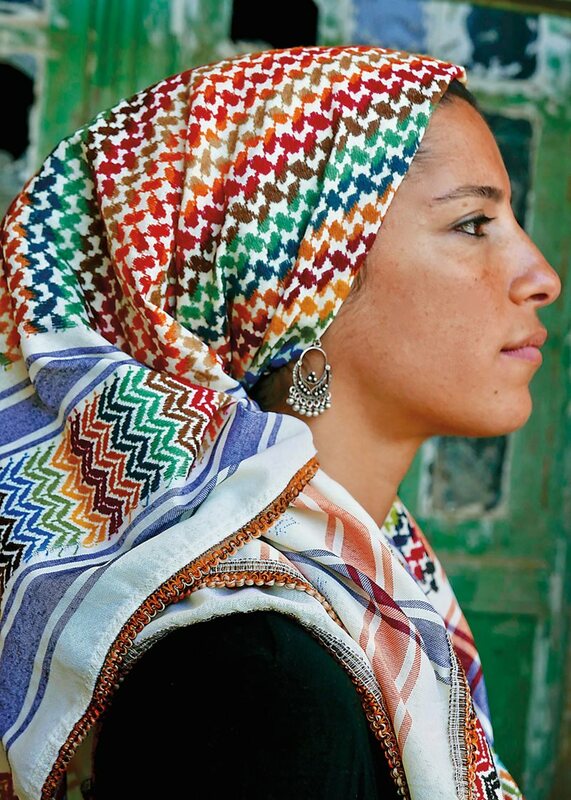 Meriem Ishawiyen wears a rainbow-colored kufiya produced by Hirbawi Textile Factory in Hebron. That same year, upscale us label Urban Outfitters featured kufiya-styled scarves and shirts in a variety of colors. Though criticism for cultural appropriation on the one hand and being “pro-Arab” on the other forced the store to pull the line, they were all back the next year with price tags up to $115. At the lower end of the spectrum, “street kufiyas” have hung for sale in shops selling jeans and T-shirts in many western capitals as well as across the Arab world, priced usually between $10 and $20. Many of these are imported from China and made of synthetic cloth with printed, not woven, patterns. More recently, French fashion powerhouse Chanel in 2015 used both red-and-white and black-and-white kufiya designs for a range of garments and accessories, including dresses, jackets, shirts, skirts, blouses and clutches. Fabrics comprised silk and wool, and leather accents appeared on some items. Models showing them on the runway included us supermodel Gigi Hadid. 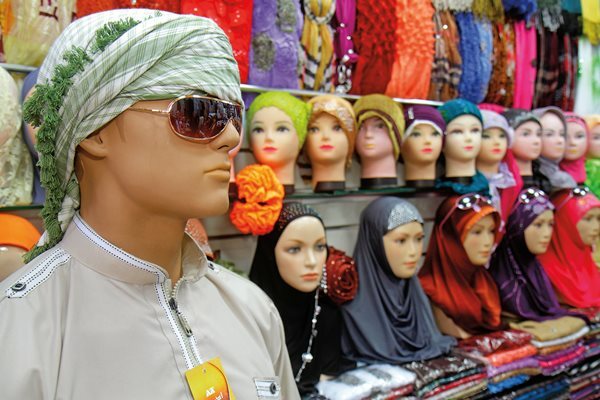 In Dubai’s Deira Murshid Bazaar, a mannequin displays a printed kufiya, wrapped turban style, in front of scarves and hijabs for women. 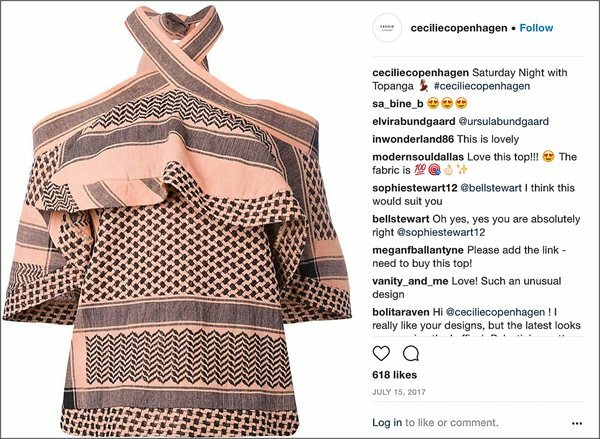 Below: An Instagram post by Danish fashion label Cecilie Copenhagen, whose founder, Cecilie Jørgensen, creates dresses, tops, shorts, belts and jackets all inspired by kufiyas. Kufiyas came later to the us, says Ted Swedenburg, a professor of anthropology at the University of Arkansas who studies identity and symbols in Arab cultures, including kufiyas. “I first began seeing the kufiya in the United States around 1983, without fully understanding its context,” says Swedenburg. “In the last decade, kufiyas, in all colors, are being worn by actors and celebrities.” He goes on to namedrop Mary-Kate Olsen, Kirsten Dunst, Cameron Diaz, Colin Farrell, David Beckham, Justin Timberlake, “and even [us Senator] John McCain’s daughter,” Meghan McCain. For many, however, wearing kufiyas was largely “a matter of trendiness,” says Swedenburg. “I think we have to ask why the kufiya became trendy, or edgy. That relates to the growth of antiwar sentiment in the us in the 2004 to 2008 period.” It also coincides, he explains, with the moment low-cost kufiyas became more widely available. The name kufiya is transliterated from Arabic in various ways—keffiyeh, kuffiyah, and more—but they all mean the same thing, and they owe their differences to how the word was transliterated and by whom. Kufiya keeps close to a literal linguistic transliteration. This same cloth headdress also goes by a series of other names in Arabic, which indicate regional identities and influences. Shamagh, a kufiya that is almost always red and white, is a name often used by Bedouins, or groups with strong Bedouin heritage, many of whom are in Saudi Arabia and Jordan. The shamagh has a thicker fabric, which keeps the wearer warm in the cold desert nights. In the case of Jordanian shamaghs, the number of tassels can represent the town or area the wearer comes from. Ghutra is the name most used in the Arabian Peninsula for an all-white headdress. It is usually worn with a small cotton or knitted hat underneath known as a taqiya, which allows the ghutra to better keep its shape and makes it easier to style. Chafiyeh is the Persian name for the headdress, but it is usually worn in the style of a turban, with a larger variety of colors: dark green, dark blue, dark purple and variations. 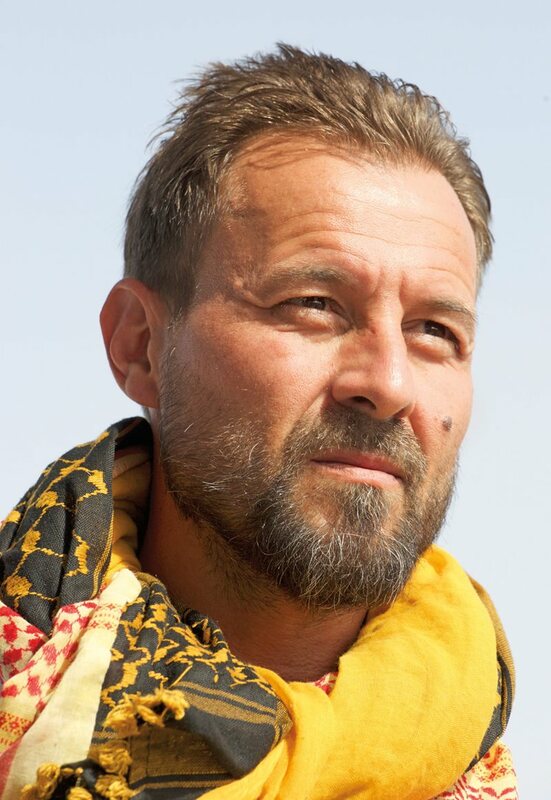 Jahmahdani is Kurdish, and it too is worn in a turban style; however, it is almost always either a black-and-white fatha design or red and white. Far closer to the roots of kufiyas are the designers and textile artisans of the nonprofit Social Enterprise Project (sep) in Jordan. Their designs are pushing toward what kufiyas might become while holding to the cloth’s traditions. sep kufiyas often include embroidery—a traditional art especially in the Levant—and thoroughly nontraditional but trendy and seasonal colors—grays, beiges, oranges, reds-on-blacks and more. 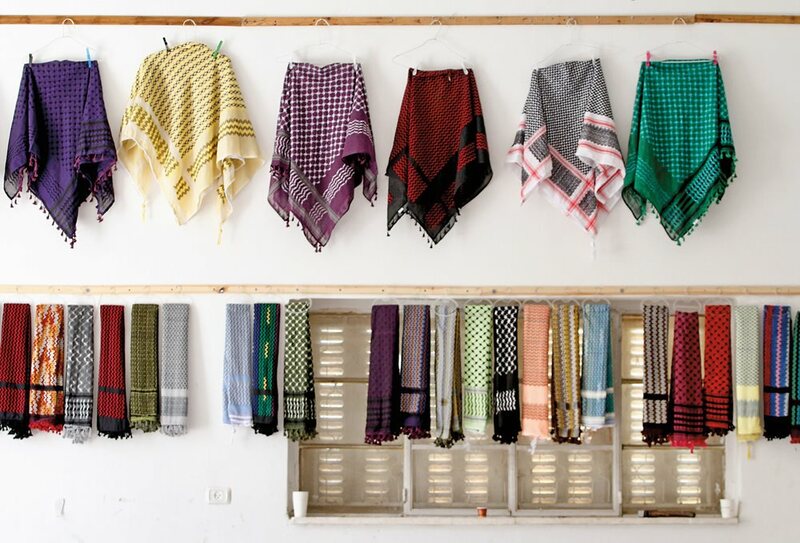 What makes these designers distinctive is that they all work out of refugee camps, explains Roberta Ventura, a Geneva-based investment banker who supervises the design and production of handmade kufiyas in the Jerash Camp in northern Jordan. To start, women use the traditional red- or black-and-white designs on cotton, linen and cashmere, before combining them in a series of different colors with the distinctive, fine cross-stitch embroidery used in traditional Palestinian dresses. The crafted kufiyas then sell in high-end stores across Europe, Asia and the Americas. Designer Rashid Abdelhamid wears one of his custom kufiyas in Amman. “I include Tunisian velvet, Egyptian cotton, Turkish brocade, Anatolian peasant designs, Caucasian linen and sheer silks,” he says. The kufiyas, Ventura says, are among more than two dozen fashion accessories made in the camps for sep Jordan and sold to support the women workers, who are paid middle-income salaries. “The kufiya is our bestselling item,” says Ventura. Ventura is thrilled at the success of the kufiyas, which is poised now for a next step: After years of selling online and in select stores, this year it is producing an exclusive, top-end kufiya for the department store Boutique 1, where it will sit alongside scarves by designers such as Missoni, Rochas and Elie Saab. While the design is not yet finalized, Ventura says, “there’s more embroidery.” The price is set to hover around $280. Ninety-five percent of kufiyas have always been made of pure cotton, mostly from Egypt or India, largely woven in Syria, Palestine and Iraq. Today more and more are being made in combination with polyester, while some made in India are woven out of cashmere and wool. Working from an Amman penthouse studio, Palestinian Serbian architect and kufiya designer Rashid Abdelhamid is similarly fusion oriented. He dismisses talk of cultural appropriation, and his website, Made in Palestine Project, displays kufiyas in an abundance of colors and combinations of fabrics. Original black-and-white or red-and-white fatha fabrics are incorporated, but more frequently they are being replaced by other colors and styles. The original kufiya designs are always present and visible, but always fused, combined, highlighted and sometimes only exist as accents that gives a thin root to the designs, gentle nods of recognition. Abdelhamid asserts that while indeed his kufiyas reflect his own Arab European hybrid identity, they also symbolize contemporary historical context. “I was born in Algiers and studied in Florence and Grenoble [France]. I travel between Dubai, Ramallah, Tunis and Amman. What I wear reflects these multiple cultures and identities—and many people are like me,” Abdelhamid says. Meriem Ishawiyen, left, and Diana Boghossian, center, wear multicolored modern kufiyas by Hirbawi; Maytha Alhassen, right, models a kufiya dress from Artisans du Liban et d’Orient in Beirut. Working his way among the looms running at Hirbawi Textile Factory, Abd al-Aziz al-Taraki monitors quality for the two most traditional kufiya designs, which remain popular worldwide. The origin—and name—of the kufiya is said to go back to a battle between Arab and Persian tribes near the Iraqi city of Kufa in the early seventh century ce. Arab poet and historian Yousef Nasser recounts how before the battle, the Arabs wove headbands—‘iqals—from camel hair to hold the plain headcloth in place so the Arab fighters would recognize their compatriots. Fashion historians from the Arab world agree on several facts concerning the history of kufiyas. Both the concept of the ‘iqal and the original fatha design originated in Iraq; the cotton used to make kufiyas came largely from Egypt but also from the Indian subcontinent; kufiyas were initially produced on looms mainly in Damascus; and it was the nationalist movements of Palestinians that in the 1960s first made kufiyas globally famous. According to the Hirbawi family, which owns and operates the only kufiya factory still working in Palestine, three factories in Damascus began to flourish in the early 20th century when the use of the Ottoman tarboosh among men declined along with the empire that had popularized it. Rural men began to change the manner the kufiya was worn by no longer wrapping it like a turban but wearing them more loosely like headscarves. The red-and-white kufiya has origins that are also military but relatively recent, says Widad Kawar, a Jordanian expert and collector of traditional garments. In the 1930s, Jordan-based British General John Bagot Glubb (also known as Glubb Pasha) sought to create a distinctive headdress among Arabs loyal to British rule. He is credited with ordering the production of red-and-white kufiyas. These red-and-white kufiyas, mostly manufactured in British cotton mills, were of thicker cotton, and their pattern more densely woven, than traditional black-and-white kufiyas. They quickly became popular among men in the wintertime and in the desert, where the nights could be bitter cold. “All the men loved the red-and-white one,” says Kawar. “Glubb Pasha could not control who wore it. The Syrians loved it, as did the Iraqis and the Saudis.” The red-and-white kufiya became standard-issue headwear for Britain’s colonial Palestine Police Force, Sudan Defense Force and Libyan Arab Forces. A wall at Hirbawi’s displays a selection of the 55-year-old factory’s 42 contemporary designs. There was one place, however, where neither black-and-white nor red-and-white kufiyas were popular—but green ones were. In the 1950s, English writer Gavin Young lived for two years with the Marsh Arabs of southern Iraq. There, he noted that community leaders wore dark green kufiyas to assert their identification with descendants of the Bani Quraysh—the tribe of the Prophet Muhammad. In the 1960s, black-and-white kufiyas became synonymous with Palestinian nationalism, and thus “the last kufiya factory in Palestine,” Hirbawi’s, in the city of Hebron, has taken on an iconic significance. Founded in 1963 by Yasser Hirbawi, the factory is now run by his three sons. “When my father founded the factory in 1963, there were no other kufiya-making factories in Palestine,” says 60-year-old Judeh Hirbawi, Yasser’s eldest son. All were made in Damascus. In 1963 Yasser bought two Suzuki mechanical looms made in Japan, which produced some 300 kufiyas a month, explains Judeh. They were all black and white—like the ones from Damascus. By 1965 they started to make red-and-white kufiyas as well. Six years later the Hirbawis had six machines and were producing around 900 kufiyas of both types each month. “By the 1980s the ‘salad’ design was introduced by my younger brother Izzat Hirbawi, who combined up to six colors to modernize the kufiya,” says Judeh. Today Hirbawi’s produces 42 different color designs, but the most popular is still the black-and-white classic, followed closely by the red-and-white. It was not until 2000 that the Hirbawis began to export. Today the Hirbawis have 14 mechanical looms, still Suzukis, and 10 new ones were delivered last year. Annual production is around 60,000. “Business is up, and we are exporting to new designers in Amman and Europe, says Judeh. “The kufiya is in fashion again,” he adds with a smile. Filmmaker and writer Mariam Shahin has produced and directed more than 60 documentary films, and she is co-author of Unheard Voices: Iraqi Women on War and Sanctions (Change, 1992).